Our hunts are done over bait to ensure plenty of deer activity near your stand location. We start our intensive baiting program several weeks prior to the season to ensure that the deer are accustomed to frequenting our bait sites. Each site is maintained regularly throughout the season to hold the deer in the areas we want them and to ensure you are hunting an active bait location. 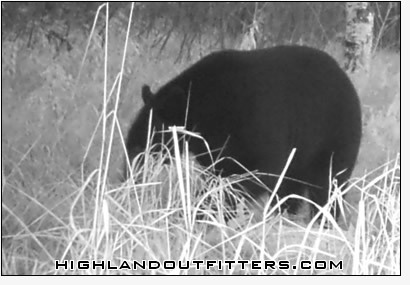 We also utilize trail cameras to help keep track of the big boys. The majority of our stands are elevated box blinds that offer a full 6’4” of standing room making for a much more comfortable day on stand. These are great as they can be heated if necessary and offer an elevated view of the bait location taking the forest undergrowth out of your line of sight. We also utilize enclosed ground blinds as well as climbing tree stands if the situation dictates. Prior to your hunt we do everything in our power to increase your odds of taking a trophy buck. 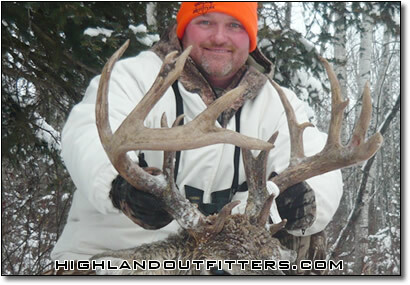 During the week most hunters will have numerous opportunities to harvest a 125” – 150” buck. Our goal is to have you take a mature buck with heavy horns, many of which will score well beyond this. These deer may have any number of points but the real giveaway is usually a big body and heavy horns. The younger deer may have nice 5 X 5 or bigger racks and would make a fine trophy most anywhere but these are the real giants of the future which we want to leave so they can reach their potential. The trick is that you usually have to let a lot of nice immature deer walk until you see a real mature Saskatchewan buck. In the end it is your hunt and you do have the choice to harvest any deer you want. To help encourage harvesting only mature deer, we offer a $500.00 credit towards your hunt next year should you choose not to fill your tag. Here you are, sitting quietly in your tree stand enjoying the panoramic view of nature over your bait site peering into Saskatchewan’s famed northern forest land. While watching the playful martins scamper about, your heart starts pounding when all of a sudden a big bruin lumbers into your line of fire looking for a snack after a sleepy hibernation. Join us this spring for a full service black bear hunt from a beautiful lodge on Saskatchewan’s famed forest fringe. The majority of our stands are elevated box blinds that offer a full 6’4” of standing room making for a much more comfortable day on stand. Our stands provide shelter from the elements and offer an elevated view of the bait location maximizing your line of sight by eliminating the forest undergrowth out of your line of fire. We also utilize enclosed ground blinds as well as climbing tree stands if the situation dictates. Prior to your hunt we’ll do everything in our power to increase your odds of taking a trophy black bear by regularly maintaining the baits therefore ensuring the stands are properly placed. During the course of your week long trip with us you will have the opportunity to watch various bears come and go from your bait site. An added bonus of hunting in our location is that you may even get a shot at one of the highly coveted color phase bears as they are known to frequent our area. While not for the faint of heart, a Northeast Saskatchewan bear hunt with Highland Outfitters is an experience you won’t soon forget.